We're working on a PC desktop software for financial professionals. Our users tend to be very detail oriented and extremely cautious of errors. We have a new feature that allows our customers to import financial data from a 3rd party. Upon a successful import, each newly updated file will open in their desktop and it will show the new data. At this point our users may assume that the data import is complete and proceed with closing the files. But, if they close the file without saving - the data will be lost. There is no "undo" - they would need to repeat the entire import process again. We want our customers to know that they must save these files in order to keep the new data. We're going to display "Warning" messages after users click on the close button. Please advise which option you think would be more effective in making sure our customers don't make the wrong choice. Correct your design rather than trying to solve this with an error message. 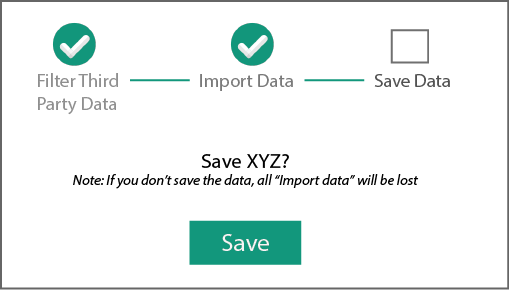 Imported data most likely should be saved automatically, without requiring an additional user action. Even if you do need an explicit save action for some reason, you should save the program state so the data is not lost when they close the program--if they close without saving, they should see a partially completed import with the data there the next time they open it. Not sure why you want users to explicitly 'save' if it's that critical. As dan1111 mentioned in previous answer, you may want to consider autosaving/revisit information flow for this task. That said, if you need explicit saving, option B is better than option A. Popping up two dialog boxes is confusing in most warning dialogue cases. It's advisable to provide all the necessary information before the user selects a certain option. Also, name your action buttons what they do rather than Yes/No. Using Save/Delete instead of Yes/No could also solve user's confusion of which actions they are agreeing to. Hope this helps! Not the answer you're looking for? Browse other questions tagged desktop-application save modal-windows error-prevention or ask your own question.